A few weeks ago, we shared the story of our trip to Philadelphia to scavenge parts off a Cold War destroyer, ex-USS Forrest Sherman. 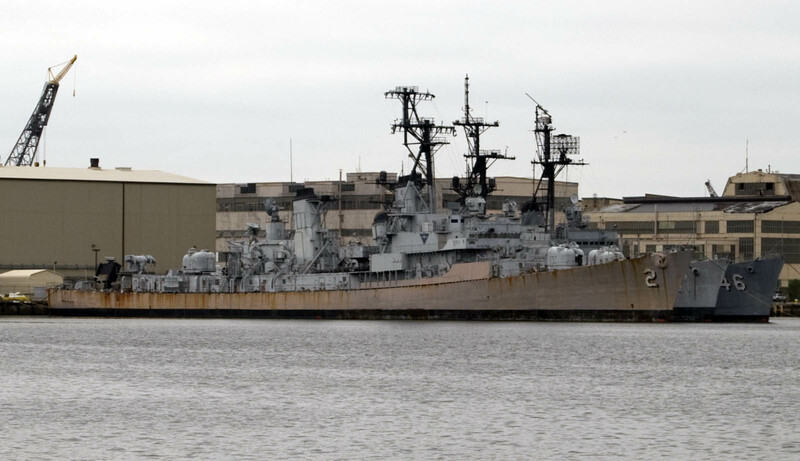 Moored alongside Forrest Sherman is another decommissioned destroyer, ex-USS Charles F. Adams (DDG 2). Coincidentally, just days prior to our trip to Philadelphia, we had the opportunity to meet with John O’Neil in our offices at the Washington Navy Yard. O’Neil is the Executive Director of the Adams Class Museum, a group working to bring the destroyer to Jacksonville as an attraction on the city’s Riverwalk. USS Charles F. Adams was the lead ship of a class of guided missile destroyers built during the heart of the Cold War. Named for a Secretary of the Navy who served from 1929 to 1933, Adams was commissioned in 1960. She was the first ship designed as an anti-aircraft missile platform. The destroyer was one of the ships involved in quarantine operations in 1962 during the Cuban Missile Crisis, and also served as a recovery ship for NASA’s Mercury space program. She had a long career, and was not decommissioned until 1990. In the 1990’s, a group attempted to acquire Adams as a museum ship on the Great Lakes, in Michigan, but that group never overcame the many obstacles that are inherent in acquiring and preparing a ship for public display. The Jacksonville group, however, has made significant strides and are confident they will acquire the ship and turn her into a successful waterfront attraction The Jacksonville Historic Naval Ship Association (JHNSA) and the Adams Class Veterans Association (ACVA) have been working together, making good progress, and are in the seed money campaign part of the project. They have raised almost $500,000 to date, and have funded many of the necessary studies and advance work to demonstrate to the Navy their resolve in meeting the many requirements to safely obtain and tow the ship to its final berth. In late 2011, the Navy determined that Adams is eligible for listing in the National Register of Historic Places, as an historic vessel. JHNSA have inspected the ship many times, and they believe it can be made ready for towing to Jacksonville in a relatively short time. 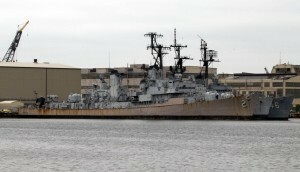 The BAE shipyard in Jacksonville will dry dock Adams and perform refurbishments such as removal of both screws and both SONAR domes, repair hull plating as needed before sandblasting, preserving and painting the hull and the above decks to the top of the masts, along with various other fixes. These fixes could cost over $2 million. 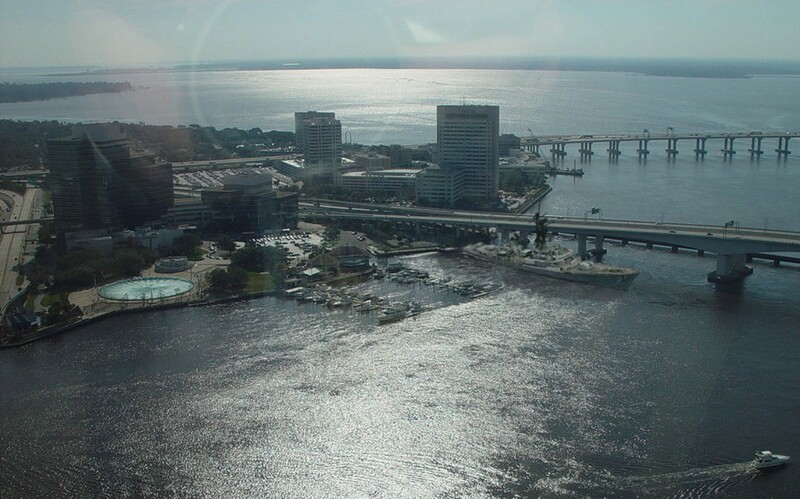 A 100 year weather event protected mooring system has been designed for a permanent berth in downtown Jacksonville, on the east side of the Acosta Bridge on the south bank of the St. John’s River – projected cost could be $6 million (see rendering below). The ship will not be returned to service or to operation other than utilizing the ship’s 110 V electric systems and possibly some 440 V.
Please visit them on the web at www.adams2jax.org for more information. CF Adams DDGs in the Australian navy are all gone, sunk as dive wrecks/fish habitat. A terrible shame.All did several tours on the gunline in Vietnam, and served for over 30 years. On a recent visit to the US, I visited USS Midway in San Diego. This fabulously presented museum is how these historic ships should be preserved. Nice to hear from u.
I am in Vienna for 5 months. A Quite H D. Hope u and y f are well. K R Mat and Ria my better half. Keep in touch. shall be back in oz in october. I served Onboard Charles F. Adams DDG-2 in 1989 and I would like to get in touch with some of the Weapons Dept personnel that were onboard her then spicifically GMG1 WAY and GMGCS Dave Clark. If you can help I would appricate it. Have you tried the Adams Class Veterans Association, Michael? Unfortunately we (the Naval Historical Foundation) don’t have any method or database to connect veterans of ships with each other. Good luck! I look forward to touring the ship in Jacksonville! Served on Brisbane and was my best sea posting in 20 years in the RAN, DDGs were the best looking war ships ever built in my opinion, to save one for future generations to see is very worth while, I will try to go have a look. Good on you guys I served on HMAS Hobart DDG 39 in 74 and 75 Ferrari of the seas.. and Vern is right best looking warship ever built…. I served on HMAS Perth and did the 3rd deployment to Vietnam in 1970/1971, I also served on HMAS Hobart in 1971/1972. The Adams class were a mighty warship in their time and served their countries proud for many years. Served on HMAS Perth first deployment ’67 – ’68. Severd in all 3 several times each over my career from AB on the gunline in Hobart in 1970 to CPO on North West Indian Ocean deployments in Perth and Brisbane in the 80’s. Love ’em. And hi to Blue Lawless who I joined up with and Vern Pasfield who was in Melbourne with me in 77. Also served on Perth on the gunline. Good luck with your endeavours. About a year ago there was much ado about a Charles F Adams Class reunion in Florida. I was and still am keen to attend if it happens. Has it all blown over or is it still on the cards? They were great ships. Commissioned HMAS Perth in Boston , served the first deployment to Vienam and paid off her as POME in 1968. She was the best ship I served on in the Australian Navy. Pity she wasn’t saved. I served on two of the DDG’s, Hobart ’73-’79 and Perth ’80-’82. My son served on Brisbane during the ’90s. We have DDG steam running through our blood in my family, a continuous friendly banter about which ship was best, drives my wife mad (that’s why we do it). DDG’s were a special class of ship, great to ride in, a pleasure to serve and a real eye catcher. There’s no better sight than a DDG plowing through the waves at speed, or coming down Sydney Harbour to Garden Island. The best ships I ever served in and they hold a place in my heart and soul. Served on all three in my time in the RAN and lucky to do two stints on Perth & Hobart. No arguement that they were the best looking warship built and there was just something with the crew that made it BZ also. I beleive Brissy was earmarked for the National Maritime Museum in Sydney when she paid off but unfortunately was too big. She would have been a great attraction. Yes they were special. Good luck to you guys in Jacksonville. Commissioned Perth in Boston. Did two deployments Vietnam 66-67. Proud to have served in her. If there is a reunion of DDG sailors in Florida—count me in. What a power plant these ships had. I am currently doing the family tree of a family friend and I have been informed that you may be related. But as she has fallen very ill she is not able to do it at the moment. Please if you could email me it would be great. Served on Perth 67-69, and Hobart 71-72. Easily the best fighting ships we Ausies have ever had, and bloody good looking too. I loved the Brisbane but have a soft spot for for Vampire where I also served for 3 y. Love to hear from you guys. Ex HMAS, Quiberon, Duchess,Derwent,Parramatta,Brisbane,Vampire,Had enaugh. Wanted to say thanks to all our DDG Aussie friends who have contiunued your support for the ACVA and JHNSA on this journey to attain the Charlie Deuce (DDG-2).I was Plankowner on DDG-2 in 1960-62 as Radar/Tech2 and loved every minute of it. I have been back aboard several times over the years and she is holding up well. We have gotten many items afrom other ships during strip ship events in Philly and stored them onboard DDG-2 for use to refurbish and make her look presentable in the future. I hope NAVSEA views our progress as a positive sign and in 2013 will release the ship to us so we can get the ship to Jacksonville. They need to know we can handle this ship and make it happen. I invite you all to join the ACVA. Go to our web site and fill out the Member Application. Hope your all well. Served on Perth 80-83 on the NWIO deployments. I will set my sites on visiting DDG -2 when over State – side. I still have a DDG-2 ball cap in my collection which I scored when we were lucky enough to be with her in Subic. Sad to report that a ‘plank owner’ of DDG41 HMAS BRISBANE passed away on June 29th. Peter Maher always said that the Charles F Adams class were the best ships that Australia ever purchased & I agree with him. We will miss the former Secretary of the HMAS BRISBANE Association. Thank so much for informing us of the sad news of Peter Maher’s passing. Our condolences go out to his family and all his shipmates. I served onboard the Adams 7/72 thru 8/76. Best ship in the fleet. I was a fire control tech for the AN/SPG-51C/D radar. Always hit our targets with our tartar missiles. See you in Jax Charlie Deuce. Served proudly onboard the incredible awesome USS Charles F Adams from 1983 to 1986, 3 1/2 years she was home, a great crew,and great Captain in R.J Branco,I served as an OS in CIC and what a great bunch of operational Intelligent folks we all were! Ha . A ship and crew I have never forgotten, hope very much the ship can return to JAX. Served on Adams and Tattnall in the 60s and70s. Loved them both, great ships. Copyright © 2011-2018 Naval Historical Foundation. All rights reserved.